After 35 years in the billiards and gaming industry, we have carried many different brands of products in our showroom. Not only are we passionate about providing our customers with the best quality gaming products, but we also have been designing our own line of products. Our exclusive line, Generations, was created by our team to showcase our years of experience and devotion to this industry. Along with our large selection of products online, our showroom in San Bernardino features a wide variety of billiards tables from Generations that have been custom designed by our team. Billiard tables are our biggest selection of Generations products. From bars to game rooms, our team takes pride in creating original tables that every type of customer would enjoy. Carnegie Pool Table: The style of our Carnegie Pool Table takes billiards to the next level. The body of this table is made out of Douglas Fir while the legs are constructed out of complete 4-inch plumber’s pipe, keeping your table sturdy for every round! Dylan Pool Table: We love the gorgeous detail on this table, as it brings more than just entertainment to your home. This table also comes with an accessory drawer, so you don’t need to take up any more room with a cue stand. Fundamental Pool Table: This table is one of our most functional pieces. It doubles as a modern dining table and full billiards table. With over 15 felt colors to choose from, you can easily customize this table to blend into your home perfectly. Harper Pool Table: From the double arch cabinet to the scalloped carved legs and leather pockets, this model is the perfect ode to the classic pool table look. This table also includes mother of pearl and abalone double diamond rail sights for added detail. With solid aspen wood in a box beam frame construction, it creates the perfect complement to any game room. Huck Pool Table: This rustic design includes natural oak and elm wood along with a metal band throughout the body of the table. The table also features genuine leather pockets to match the metal accents. Different colored felts can be installed to match the design of your home. Lodgepole Pool Table: Because of the natural cut of each Fir log that creates this style, no two tables are the exact same. This table is a beautiful addition to any home with rustic decor. Logan Pool Table: If you do not have too much space in your home, this is a great option as it is equipped with an accessory drawer inside the table. From solid wood and leather pockets, this table is an elegant original. 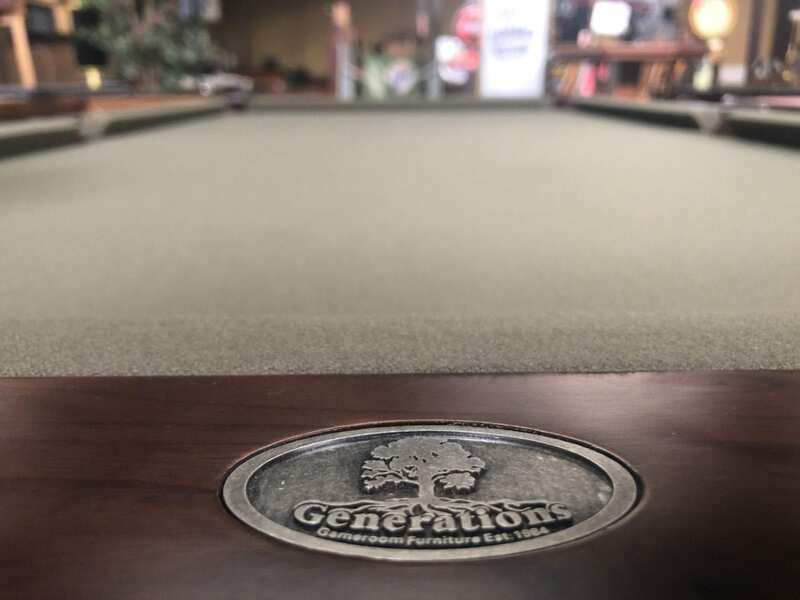 Our Generations line of pool tables was created to carry on our legacy; by providing families with products they can enjoy with one another for years to come. Looking to purchase one of our game tables online? We will ship it to you at no extra cost. PS: In just a few short weeks, we will have a completely new line of pool tables! Follow us on Facebook and Instagram to get a glimpse of our new designs.